If the larger Flitz Buffing Balls won't reach into those narrow crevices of your vehicle, the new, Super Mini 2" Flitz will. It not only has a smaller, ball surface, it also has a patented 8" shaft with a plastic sleeve to protect nearby surfaces. The extra long shaft enables it to reach deep into wheel wells, spokes, slots, motorcycle components, engine compartments, etc. The Flitz Super Mini Buffing Ball not only polishes metal surfaces, it whisks away both polish and wax residue from crevices. The rotating ball is just as effective as a polishing or buff-off tool. The material is durable Italian Viscose which glides over textured surfaces, paint, Fiberglass, Gelcoat, plastic and metal at the speed of your drill. The Mini Ball's Viscose tabs are extremely tough, and will not instantly build-up with product residue. Unlike competitng "foam" buffing balls, this material will not tear if you accidentally buff over a sharp edge or while working on diamond plate. The viscose "tabs" are different lengths, which increase the ball’s surface. The material holds a lot of residue before it needs cleaning. When that time comes, simply machine wash with your regular towels and air dry. 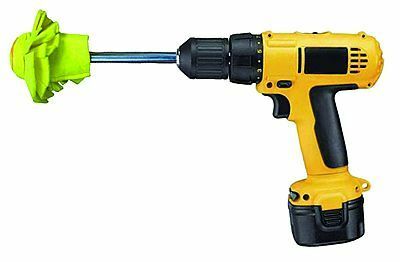 The Flitz Mini Ball attaches to any standard 3/8” or 1/2" electric drill. Application seems to work best at 2000 RPM, which is easier to control. Do not use the buffing balls at higher speeds and keep the tool moving. Do not use on clear coated wheels.